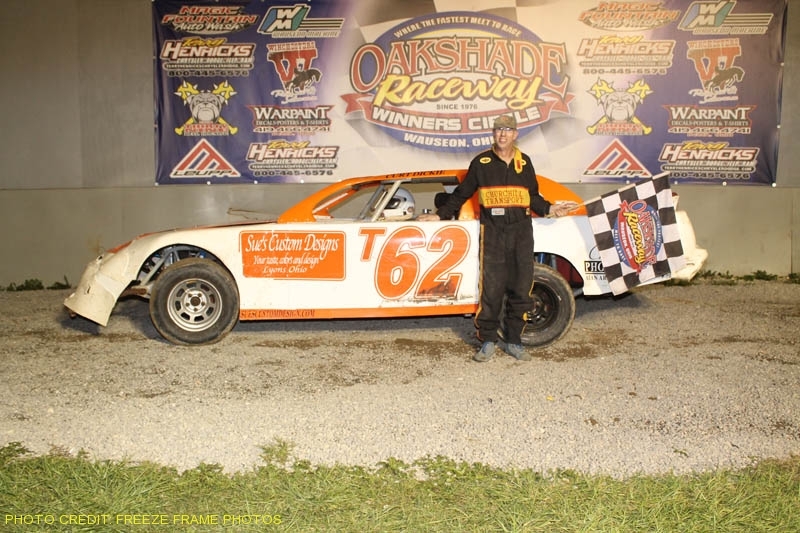 Oakshade Raceway kicked off its 28th year of racing at the high-banked dirt bullring with the Bill Reckner Memorial on Saturday night. The 2003 late model rookie of the year, Dan Wallace, once again proved he could still drive a sportsman after winning an exciting 25-lap feature. Brad Kendall was the early leader before being shuffled back through the top five. Mike Jessen and Dan Wallace took over the two top spots after a caution for debris that was a result of contact between Rob Liaeff and Randy Franks. Wallace assumed the lead on lap three after starting sixth on the field. Jessen fought back by on the high side and after a few laps of side by side racing, Jessen claimed the lead just six laps in. Amy Bernard brought out a caution after spinning off the high side of turn four. Dan Wallace took advantage of the situation and swung down low underneath the 52X of Mike Jessen on the restart to once again take command of the race. Wallace began to pull away and went on to win the sportsman feature event. Tim Fisher and Tim Bernard got by Jessen to finish second and third respectively and Chris Keller managed to finish fifth after doing a complete 360 under green on the backstretch on lap nine. The bomber A Main took the track next with just a few raindrops beginning to fall, making the track a bit greasy. The slick track didn’t intimidate the drivers as Josh Steinacker, Danny Hogrefe and Tom Ordway made it three wide for the lead early in the race. Steinacker and Hogrefe cleared Ordway and continued to battle for the lead until the yellow flag came out for Jim Chapman on lap three. Steinacker spun on the racetrack after the yellow came out and went to the pits leaving Hogrefe all alone up front. Steinacker did manage to make it back out on to the track before they went back to green, but he had to restart at the end of the pack. Danny Hogrefe made it a clean sweep on the night winning his heat event and then pulling away and taking the checkered flag in the bomber A Main. Dan Bleikamp made an exciting pass around the outside of Gary Cole in the final turn to finish a distant second. Dave Sibberson, Dennis Laney and Gary Cole Jr. got all stacked up on the front stretch on the first lap of the bomber B Main resulting in all three cars being taken to the pits. Craig Dippman looked to have a fast car, taking the lead from Jared Rendel after the restart, but immediately after taking the lead, he drove his car too hard into turn one and went up and over the banking. Dippman kept his car going, but fell all the way to the back. Joe Wohlgamuth had a great run taking the lead from Rendel on lap four and never looked back. He went on to the easy victory over Rendel, Dippman and Kyle Light. Kevin Cole, Mike Montague and Jake Rendel all took turns leading the bomber C Main. In the end it was the 06R of Jake Rendel that was first to cross the line with Montague finishing second and Cole third. Next Saturday, late model action returns to Oakshade Raceway for the first time this year along with the sportsman and bomber divisions for the first regular racing program of the year.